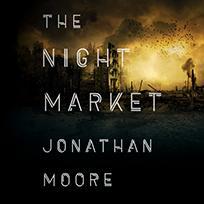 The Night Market follows Carver as he works to find out what happened to him, soon realizing he's entangled in a web of conspiracy that spans the nation. And that Mia may know a lot more than she lets on. It's late Thursday night, and Inspector Ross Carver is at a crime scene in one of the city's last luxury homes. The dead man on the floor is covered by an unknown substance that's eating through his skin. Before Carver can identify it, six FBI agents burst in and remove him from the premises. He's pushed into a disinfectant trailer, forced to drink a liquid that sends him into seizures, and is shocked unconscious. On Sunday he wakes in his bed to find his neighbor, Mia—who he's barely ever spoken to—reading aloud to him. He can't remember the crime scene or how he got home; he has no idea two days have passed. Mia says she saw him being carried into their building by plainclothes police officers, who told her he'd been poisoned. Carver doesn't really know this woman and has no way of disproving her, but his gut says to keep her close. A mind-bending, masterfully plotted thriller—written in Moore's "lush, intoxicating style" (Justin Cronin)—that will captivate fans of Blake Crouch, China Miéville, and Lauren Beukes, The Night Market follows Carver as he works to find out what happened to him, soon realizing he's entangled in a web of conspiracy that spans the nation. And that Mia may know a lot more than she lets on. Jonathan Moore lives in Hawaii with his wife and son, and is the author of five books. Before completing law school in New Orleans, he was an English teacher, a bar owner, a raft guide, a counselor at a Texas wilderness camp for juvenile delinquents, and an investigator for a criminal defense attorney in Washington, D.C.